Ever wonder what the old Puerto Vallarta of Elizabeth Taylor and Richard Burton was like? Destination:PEACE is teaming-up with Puerto Vallarta’s Villa Leonarda, former gathering place of Old-Hollywood, for its Volunteer Vacations. Travelers can experience the old-Mexico charm of days gone by in an unforgettable vacation experience. The intimate setting of Villa Leonarda in Puerto Vallarta’s historic center will be the starting point of a Destination: PEACE vacation focused on the betterment of the community. Travelers will enjoy a luxurious vacation, enjoy cultural enrichment, the rejuvenation of yoga and engage with the local community- helping with local beach cleanups or spay and neuter clinics for local animals. At the same time, guests will have ample free time to explore the narrow flowered-lined lanes just outside the door of Villa Leonarda or venture further to explore the rich history and hospitality of the Banderas Bay region. "We are thrilled to offer this beautiful and historical Villa to our volun-tourists who come to experience the culture and history of Mexico while joining real hands-on projects with local kids, animals and the environment,"says Katherine Fisher, founder of Destination:PEACE. Destination:PEACE has the inside track, as seen in Vanity Fair, in keeping with current publicity. Still a fascination after all these years, one of the top publications in the world is featuring a story this month on one of the most famous romances in history, Elizabeth Taylor and Richard Burton. 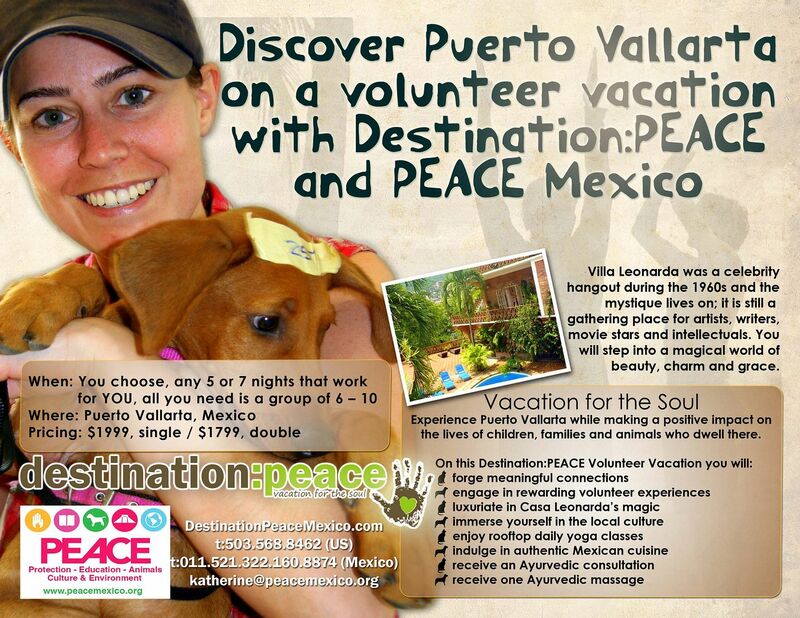 Destination:PEACE is promoting a volunteer vacation at the villa they used to visit in Puerto Vallarta, Villa Leonarda. Recently renovated with a sophisticated yet traditional hacienda style, Villa Leonarda has all the comforts one could ask for including gourmet cook and maid service daily, refreshing heated pool, tranquil open courtyard, lush gardens and chic decor in a relaxed atmosphere. The Villa is located in the quiet neighborhood known as Gringo Gulch, tucked into the hillside of one of Vallarta’s most famous residential areas, situated on the peaceful River Cuale. The original owner was a famous clothing designer and close friends with Elizabeth Taylor and Richard Burton which quickly turned the Villa into a celebrity hangout during the 1960s and the mystique lives on; it is still a gathering place for artists, writers, movie stars and intellectuals. “The best thing about traveling is getting to know places like Villa Leonarda: full of light, happiness and friendliness. With the doors always open and the heart in plain view; with generosity blooming in each leaf and every flower of the garden…” said Laura Esquivel, author of Like Water for Chocolate. “Villa Leonarda is Mexico…the Villa itself brought so much joy: the laughter from the pool, wonderful meals cooked for us and served in the elegant dining room, the peaceful courtyard where we often gathered, fireworks from the roof top, and the feeling that we did not even need to venture outside the doors. It is said that walls talk and Villa Leonarda has much to say about the culture and history of Puerto Vallarta…” said Carol and Grenfell Adams of Newfoundland, Canada, recent visitors. Destination:PEACE was born out of an idea to couple volunteer opportunities with the amazing landscape that Mexico offers as a vacation destination. During a Destination:PEACE Volunteer Vacation, guests will experience another culture while making a difference in the lives of others: children, women, families, animals and the environment. A volunteer will help raise awareness and contribute to the overall love, community and hope to the people and animals affiliated with the local community. Destination:PEACE gives back a portion of their proceeds to the non-profit involved in order to further their mission. Volunteer vacations range in cost from $1699 to $1999. Destination: PEACE also offers private, customized vacations. For more information on Destination:PEACE Volunteer Vacations visit www.DestinationPeaceMexico.com. I really like your essay. Thanks for your sharing.I like it very much, thanks! I love beach because its too natural , and i love to roam around beaches. i like this article and will look forward to your next blog.